Houston parking lot striping not only enhances the aesthetic value of a property, it also increases public safety. 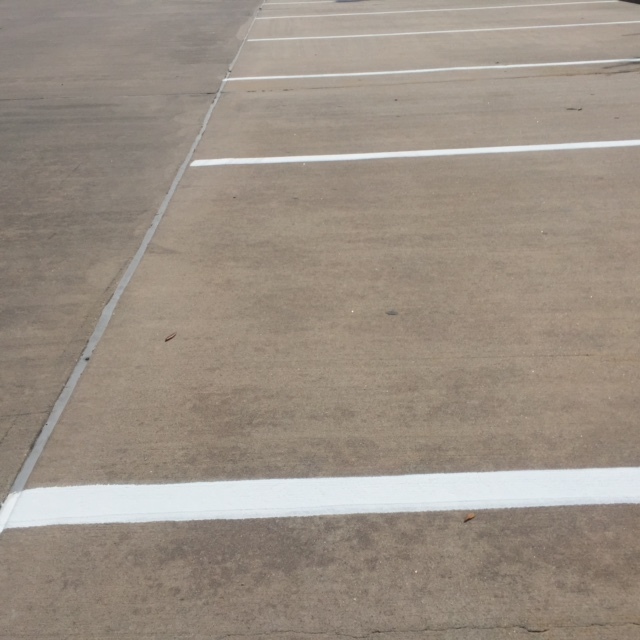 Parking lot striping is required by law for commercial parking lots throughout Houston. Not only does quality line striping put your business in compliance with local laws, it can also help prevent lawsuits for accidents that may occur on your property. 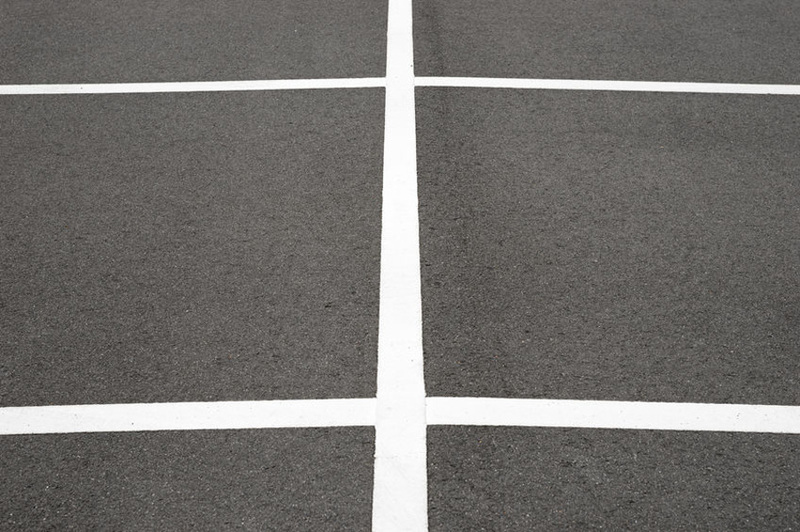 Pavement markings should only be applied with professional equipment and high-quality, long lasting paint. 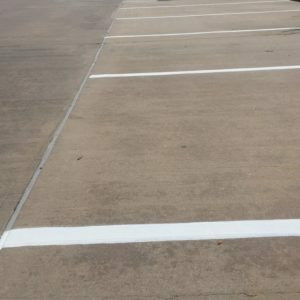 Houston parking lot striping and seal coating are considered regular maintenance for parking lots and generally should be applied every two years. New Layout: Consists of applying fresh paint to a new pattern. If construction plans are not available, we can assist with the parking lot design. Re-Striping: The most efficient way of rejuvenating a parking lot. We can either re-paint the existing layout, or we can completely remove the old lines and paint brand new ones. Sign installation: Parking lot sign certainly compliment lot striping in a variety of ways. Not only do they assist with traffic flow, they are long lasting. Asphalt Crack Repair: Cracks in the asphalt parking lot are detrimental to the integrity of the surface. They can allow water under the surface, which will erode the foundation. Addressing and repairing cracks these cracks right away can save money in the long run. Car stop bumper removal/ installation: Car stops are an effective way of protecting buildings from parking vehicles. They also help prevent vehicles from blocking a sidewalks with the front or rear-end. Curb/ Car stop painting: Painting curbs are perfect for allocating fire lanes, no parking zone, and even ADA disabled parking areas. When an asphalt surface is not properly maintained water infiltration can occur through cracks; this often results pot hole creation. Any top line striping company knows how to handle alligator cracking and pot holes. We start by saw cutting a square or rectangle pattern outside of the deteriorated area. We then remove the damaged asphalt and any unsuitable base material. If new base materials are needed, they are placed and compacted to ensure a solid base for the new asphalt. The saw cut edges are then tacked with Tack Oil and new asphalt is placed and compacted. The cost of removing and replacing asphalt varies depending on location and repair square footage. To avoid this expense, it is very important to establish a Preventative Maintenance Program including routine crack sealing and seal coating. The primary cause of Cracks in asphalt is sun oxidation, which causes asphalt shrinkage resulting in cracks. Moisture and traffic, can also result in asphalt cracking. Cracks allow additional moisture to penetrate the surface. How big should a crack be before it needs to be sealed? If your pavement is being seal coated, cracks less than 1/8″ in width may not need to be sealed. Properly applied asphalt seal coating can seal hairline cracks. CAN I SEAL CRACKS IN COLD WEATHER? Yes, you can. However, moisture can be an issue if temperatures are below freezing. When frozen, it can be hard to see. The pavement should be tested with a torch or a heat lance. Warm the pavement, remove the heat source, and then observe the are for moisture. Damp pavement will not allow the sealant to stick. If pavement is dry, follow the seal coating instructions for heating and application. It is recommended to use a heat lance in cold weather. WHAT CRACK SEAL MATERIAL SHOULD I USE? Using the right sealant is essential to proper installation. Products that is not too soft in the summer heat but remains flexible through the winter are recommended. Use hot rubberized sealant only, as this sealant will works excellent in cold and hot climates. Asphalt maintenance contractors as well as property owners, property managers, and the general public all know the importance of having an aesthetically pleasing parking lot or driveway. The pavement is the first and last thing they see as they are entering and leaving a property. This is why it is so important to be on a routine preventative maintenance program. This will help to maintain the value of your property, as well as to extend the life of the pavement and saving thousands of dollars. Houston seal coating costs pennies per square foot and replacing asphalt costs dollars per square foot. Pavement that has not been sealed over time will become oxidized, brittle and dried out allowing moisture to penetrate the pavement. Water penetration will rapidly deteriorate the pavement. In a cold climate, as water freezes within the pavement, it expands, causing pieces of the aggregate to break apart. Seal coating reduces these effects by waterproofing the pavement. Seal coat fills voids in the surfaces, thus making it much smoother. A smooth surface is easier to clean, making parking lot sweeping more effective. Prior to seal coating, patchwork and crack repair must be completed. Cleaning and preparation are critical. Depending on the condition of the pavement, a variety of cleaning methods and equipment that may be used. Typically, the pavement is cleaned with a very aggressive power scrubber, followed by an air vacuum sweeper. Then seal coating specialists make their way across the entire pavement with hand wire brooms and large walk behind blowers to ensure the pavement is completely free from all dirt, dust, and debris. There are many methods of applying the seal coat. Methods can vary for each location. An evaluation is important to properly determine which method best fits the location’s surface. for example, a really rough pavement may need two coats applied by squeegee; where as a smooth pavement may only require one coat spray application. Note, too much sealer, especially on newer pavement can be a bad thing. Not enough sealer in high traffic areas can result in sealer wearing off prematurely. We encourage you to have a Professional line striping company evaluate your project and determine which method best fits your pavement. Remember all sealers are not equal. A highly recommend sealer is Pitch Black® Asphalt Emulsion. After application, area should be free from traffic for a minimum of 24 hours. Choosing a line striping Company that operated 24 hours a day can help mitigate interrupted traffic flow.